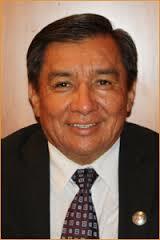 Benny Shendo, Jr. is a member of the Jemez Pueblo Tribe. Over the years, Mr. Shendo has served in various capacities of management and leadership in business, tribal, university, and state government. Presently, he is vice president for business development at NB3 Consulting, with his business partner Notah Begay III, a professional golfer. He is also a project director for the Native Community Foundation for New Mexico; a former New Mexico Cabinet Secretary for the Department of Indian Affairs; 1st and 2nd Lieutenant Governor, Pueblo of Jemez; and assistant dean of students at Stanford University. Mr. Shendo was selected as a Fellow by the W.K. Kellogg Foundation’s National Leadership Program from 1997-2000. In 2004, he received the Mary G. Ross Award from the Council of Energy Resource Tribes for professional achievements. In 2007, Mr. Shendo received the First American Public Advocate Award in recognition of Outstanding Leadership and Contributions made to American Indian economic and business development by The National Center for American Indian Enterprise Development. He started the first charter school in Jemez Pueblo (K-8) in 1999. Mr. Shendo is a graduate of the University of Colorado at Boulder, College of Business.